Parents who want their children to grow up to become well-rounded adults may encourage them to participate in a wide range of activities from a young age. 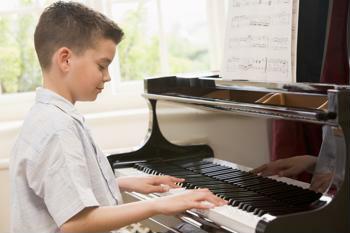 Music instruction and other artistic endeavors are especially popular options, and a new study from Michigan State University reveals that such experience could lead to professional success in adulthood. MSU researchers reached this conclusion after making a connection between participation in arts and crafts activities in childhood and businesses and patents created in adulthood, according to a press release from the University. "If you started as a young child and continued in your adult years, you're more likely to be an inventor as measured by the number of patents generated, businesses formed or articles published," said Rex Lamore, director of the University's Center for Community and Economic Development. Some MSU students, such as sophomore Nick Verbanic, agree with the study's findings. The chemistry major told The State News that he has been playing music since he was in sixth grade and is better able to express himself because of it. He cites music instruction and his ability to play an instrument as the reason why he can be more creative and inventive. In addition to music instruction, the results of an IQ test for kids may be able to reveal signs of children's potential.